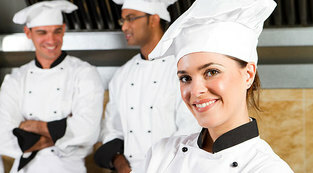 Catering Service Niagara - Professional Caterers for Corporate Events, Weddings, BBQs, Party Catering and More! Welcome to Niagara Catering Services! Niagara Caterers would like to thank you for stopping by to check out our amazing and professional catering services. We are one of the top catering full service events company providing our exceptional experience in the St. Catharines, Niagara Falls, Niagara on the Lake Catering events, and Welland areas of Southern Ontario. Let our catering Niagara services bring to life any event. Our catering company has been serving clients for several years with a reputable name you can trust. With our professional staff, we create a dining experience you’ll never forget. With our wonderful presentation, highly skilled chefs, prompt set up, and friendly waiters, your next event will run as smoothly and seamlessly as possible. 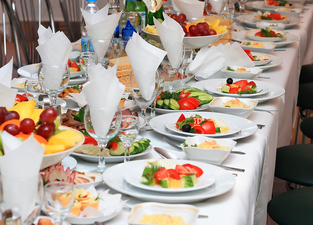 Niagara Catering Service is one of the best quality full service event services for catering in St Catharines, making it you’re number one choice for all your catering needs. We offer top of the line catering for weddings. Let us help you create wonderful memories with delicious and elegant food. Our professional chefs are experienced and knowledgeable in all types of cuisine to ensure you have exactly what you want for your special occasion. Leave the prep work, menu planning, cooking, and cleaning up to us so you can have a more relaxed day and event. Need a company for catering Niagara Falls locals always use? Instead of spending all your time in the kitchen, you can spend it with family and friends, sharing, laughing, and enjoying incredible food. With large or more intimate affairs, we take care of everything. Our chefs are sensitive to clients’ needs, including any dietary restrictions or allergies, including vegan, vegetarian, diabetes’s, gluten-intolerant, and more. Whatever your dietary needs may be, we can accommodate those for you or your guests. 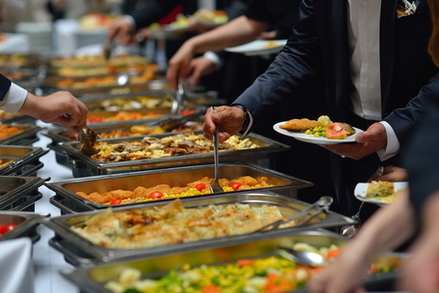 Unlike other St Catharines catering services, we also offer different serving options, such as buffet style and banquet serving for a more intimate setting. We also take great detail in when and how you want your guests to receive their refreshments and desserts. You’ll simply be amazed with one bite of our tasty appetizers, delectable desserts, scrumptious entrees, and delicious sides, refreshments, and other mix-ins. whatever your style or food preference may be, we can tailor it to fit your requests. Our services are vast. When it comes to the ultimate party and gathering, give our specialized events catering services a try. We serve large group parties without a hitch for a seamless and incredible dining experience. We accommodate all types of guests with delicious cuisines. Let us know your party and we can start exploring your options today. 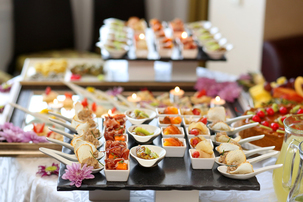 Nothing says sophistication and elegance like our catering services and food. 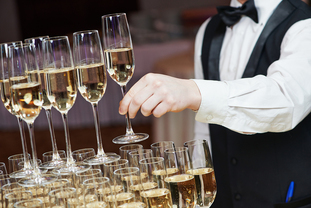 Impress clients, business associates, and give them a luxurious dining experience with our full service events. From presentation to the delicious food, you’ll ensure your clients are having a wonderful time. 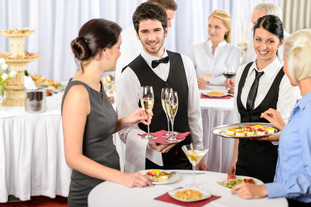 Show your appreciation and professional touch by hiring us for your next corporate event. Enjoy our mouthwatering ribs, briskets, sausages, ribs, and more! With highly favorable and seasoned BBQ, you’re event is sure please. We bring everything you love about BBQ to you. We also offer delicious sides and different serving options to fit your occasion. Take the stress out of planning and serving your next holiday or birthday bash. When it comes to serving large groups, our event catering service St Catharines has you covered for all of your birthday party catering needs and wants. We cook delicious ethnic dishes for holiday parties, and will make sure everyone has a wonderful time with our exceptional food and service. Our best caterers help you create causal or intimate tea and brunch parties for your next engagement. 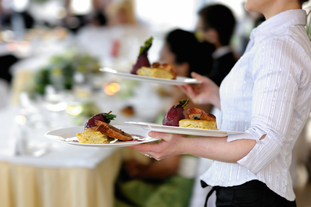 Wherever your venue is, our professional staff will be there promptly to serve you and your guests. We have amazing pastries, desserts, and other beverage options for a wonderful dining experience. For the best Welland catering company be sure to give us a call today! Are you looking for a company that specializes with catering in niagara and the surrounding area? Let us make this traditional event extra special with customized menu and serving options. We want all our guests to have an enjoyable and memorable time with great food. Hire our Thorold catering team for amazing party catering ideas with delicious beverages and appetizers. We can create an elegant and mingling environment for you with great food. Enjoy interacting and making memories with everyone at your next cocktail party. 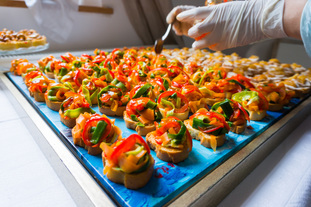 With our exceptional and best catering services let us help create a wonderful mood for guests at your fundraising gala. We provide our great service and quality food to help others give back. We serve many local charities and functions, and our experience speaks for itself. Mark memorable events with unforgettable food. We serve amazing entrees, appetizers, cocktails, and more at any baby shower or bridal party. We go the extra mile to make sure you have a perfect day. Call us to book your wedding catering, baby and/or bridal party today. 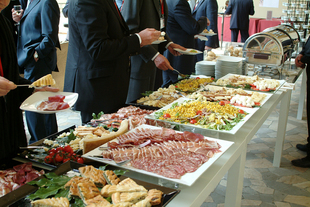 Impress prospective buyers and agents while providing excellent food options for them to enjoy. We've done many Grimsby catering events at open houses. Get the creative juices flowing as you engage in conversation and hopefully sales. Our St Catharines catering company will help you create a wonderful atmosphere, and our food will bring all your clients, fellow agents, and more together. 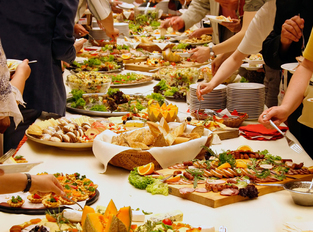 When it comes to planning and feeding large or small groups of people for anniversaries or family reunions, it may be daunting knowing where to start. Let us take care of all the food preparations, cooking, serving, and clean up. We have been catering Welland families for many years. This is your special time to enjoy friends and family. We supply the great food and energy so you can have an unbelievable experience with loved ones. We even offer a unique wedding reception catering service at a very competitive price. We're the top company that does catering for parties in the Niagara area. We've done many Beamsville catering events and nothing is more exciting than celebrating a graduation. Let us pamper you with our delectable food and buffet style serving options. You’re sure to have a fabulous time with our delicious food options. 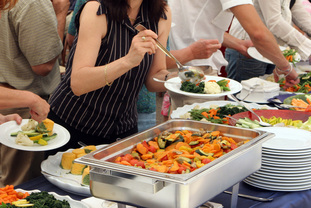 Our outside caterer will provide exquisite catering Niagara On The Lake Locals desire. 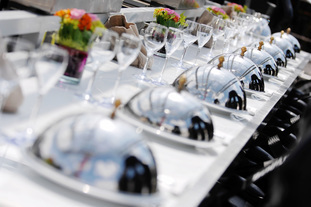 With our Niagara catering company, we can serve you at any outdoor function. This is a great option when serving a number of people, and want to enjoy wonderful weather and activities. 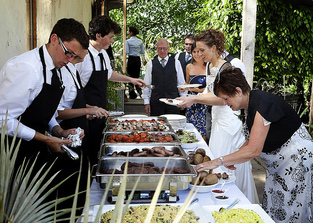 We also have wedding caters who provide gorgeous outdoor wedding catering services in Niagara. Celebrate and enjoy with family and friends special milestones in life. We are here to provide all your dining needs. Call us today for more information and availability about a home catering service! We strive to create a one of a kind dining experience for our clients. Thanks for stopping by, and we hope to serve you for your next event or special occasion. Our Niagara Falls Catering Company invites you to contact our office at 289-273-2266 or fill out the form at the top right of your screen to discuss your catering needs.